Mirko Beljanksi, a French molecular biologist, discovered plant extracts that can help people with cancer - or those wishing to avoid it. The extracts proved beneficial to the President of France, François Mitterrand, during his battle with prostate cancer in 1994. He took the molecular formulas, regained his health, and went on to complete his second term as president. After Mitterrand's passing, his competitors took office and the government proceeded to put Mirko Beljankski in jail. They destroyed his laboratory and, when Mirko himself got sick, he did not have access to his own plant medicine. His determined daughter Sylvie was finally able to manufacture and send him the formulas from New York. His health improved and, against all odds, he lived for two more years. Before his death in 1998, Mirko filed a complaint with the European Court of Human Rights. By 2002 they voted unanimously in his favor and condemned France for its attitude toward the scientist. Sylvie Beljanksi's goal is to carry on her father's work. To make his natural and supportive plant-based cancer-fighting discoveries known and to continue his research with various American medical institutions. "My father showed that the destabilization of DNA precludes the cancerous stage," says Sylvie in her Manhattan office. "He found molecules that can selectively help the cells go back to normal or prevent growth." The plant extracts are natural compounds, taken orally, that can support and maintain cellular health. One is from the bark of the roots of an African shrub (Rauwolfia vomitoria) and another is from a tree in the Amazon rain forest (Pao Pereira). "It addresses the destabilization of DNA regardless of the cell type," continues Sylvie. "It's not organ specific or gender specific. It works with standard treatment protocols (chemo and radiation) and it works by itself. It's non-toxic and synergistic." With great wisdom, she reached out to Columbia University, an internationally recognized leader in medical research in New York. Specifically, Dr. Aaron Katz, a urologist and at the time the director of the Center for Holistic Urology at the university's Physicians and Surgeons Hospital. The following book excerpt illustrates the university's pioneering role in testing Beljanksi's work. The healing properties of his plant extracts are finally getting full exposure, and can be put to healthy use for those in great need of its attributes. "And it wasn't just one patient; it was a lot of patients. So I said, 'You know what? Maybe there's something to this. Maybe this is real.'" 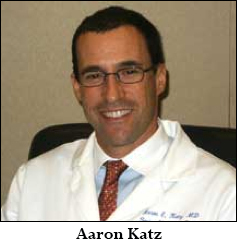 Dr. Katz lobbied for the Center for Holistic Urology at Columbia University. "I was a little bit unsure of myself, because here I am this urologist opening up a holistic center, but I did have the support of my chairman, Dr. Carl Olson, who is a world-renowned urologic surgeon; he even terms himself a 'maximal invasive surgeon' - but he also felt that yes, maybe there was a role for this aspect of complementary medicine, and that maybe I could obtain funding to examine the herbal compounds and nutrition and so forth. "These guys are traditionally trained surgeons, and how do they make their money? By operating. If it's a big operation, they get big money...and it's not to say they don't cure patients with surgery, because they do. And I'm not saying that there's no role for surgery in certain patients, because I do a lot of surgeries. But I also know that we overtreat, in terms of prostate cancer, way too many cancers in this country with overly aggressive therapies that leave men, unfortunately, with significant side effects: impotence and incontinence. And unfortunately, no therapy, even surgery, is 100 percent effective all the time." Could Mirko Beljankski's work help men with one of the most common cancers, that of the prostate? Prostate cancer is the second most common cause of cancer death among men worldwide, in particular throughout Europe and the United States. When prostate tissue is examined microscopically, cancer is found in 50 percent of males over age 70 and in virtually all males over age 90. Most of the time, such cancers never cause symptoms, but 3 percent of men exhibiting diseased prostate tissue changes die of the malignancy. In fact, many men with prostate cancer now know it is probably not invasive and that they will die of other causes long before it ever spreads. Thus, extreme treatment isn't always the right way to go. "Most doctors today do not know much about holistic urology. I am one of the few urologist involved in clinical and laboratory studies of natural formulas, so I see firsthand the best and truly worst from both sides," said Dr. Katz. "I simply want to give men everywhere the best information about integrative prostate health because the integrative health system is the greatest and most beneficial to men. My uniquely positioned work at Columbia and the Center for Holistic Urology allows me more time than probably anyone in America today to study holistic urology. "So it is my sincere desire to help all men everywhere to attain good health with the best of all disciplines - a balanced, successful approach to maintaining or regaining and then maintaining your health." Dr. Katz met with Beljanski's daughter Sylvie and widow Monique, who provided him with the background and explained Mirko's lifelong interest in plants and treatments devoid of toxicity. "I asked Sylvie a lot of questions about her father," he recalled. The two discussed her father's work during several meetings in New York City. She shared with Dr. Katz her father's many peer-reviewed scientific articles and research results, especially his applied research after leaving the Pasteur Institute and the Pharmaceutical Facility. ...his vision of the secrets of life was wholly unique and powerful. Dr. Katz recalls, "I brought home a lot of reading material!" Bringing fresh eyes to Dr. Beljanksi's research seemed to work. "I thought his science was excellent and definitely many decades ahead of his time. He was definitely the first to open up the whole field of structural DNA, and in this alone his vision of the secrets of life was wholly unique and powerful. "The next step was to take Beljanski's work and study it using rigorous scientific procedures." Everything had to be repeated, he told Sylvie. American doctors would want to see data from American labs. 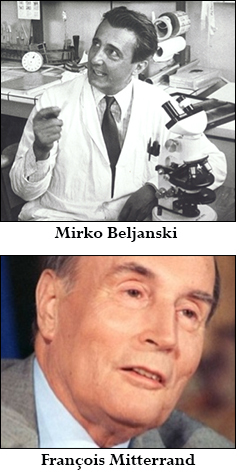 All of Beljanski's work would have to be repeated and reconfirmed in America for it to be accepted by the mainstream - and it would need to be extended into clinical trials. The first step was to retest and confirm Mirko's basic findings pertaining to certain plant extracts in the Columbia University center's laboratory. Dr. Katz and the scientific team in his department started from the very beginning with cells in cultures, and then grafted mice with cancer cells. To find out what happened next, please go to the Beljanski Foundation: beljanski.org/engl/pages/the-research-goes-on. "Columbia Connection" is excerpted with permission from the book Extraordinary Healing, by Stephen Coles, M.D., Ph.D.